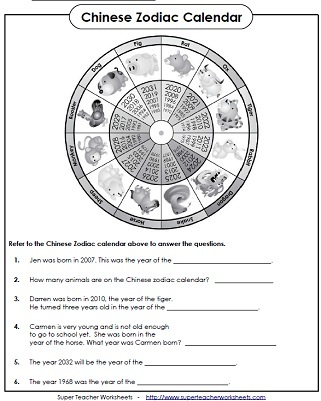 This page has a printable Chinese Zodiac wheel, Chinese New Year worksheets, and games! Make a Chinese Zodiac calendar wheel. Cut out the wheels and attach them together with a paper fastener. Use the picture of the zodiac wheel to answer each question. Color, fold, cut, and glue to make a 3D model of a Chinese lantern. This version has a dragon on it, and can be used any year. Kids will enjoy making these lanterns to celebrate Chinese New Year. This lantern template has a picture of a pig on it. Your students can cut out and color this lantern craft to celebrate Chinese New Year. This lantern features a rat and can be hung up to decorate the classroom. This printable can be made into a 3D paper lantern featuring an Ox. Included are step-by-step instructions to assemble. Cut, color, and hang this Chinese New Year lantern. It has Chinese symbols that read, "Happy New Year." Here's a different style lantern craft. Cut, color, and hang this Chinese lantern. On Chinese New Year, people give children money in lucky money envelopes. 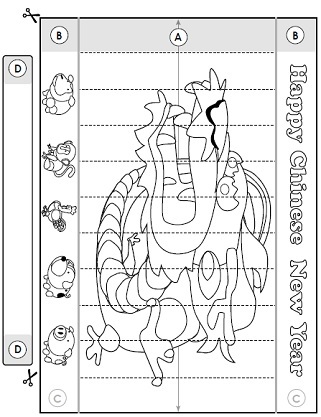 Cut, fold, and color to make your own Chinese New Year envelope. This envelope has a picture of a dragon, and the words "Good Fortune!" 2019 is the Year of the Pig. Have your students cut out, color, and glue the pig-themed envelope together. During Chinese New Year, people like to wish each other luck by giving lucky envelopes. 2020 is the Year of the Rat. Students will have fun cutting out, coloring, and assembling this lucky envelope featuring an Ox. Children can color, cut, and fold this Chinese dragon cootie catcher! A full color version of this activity is also available. Cut out and color this fun Chinese New Year dragon mask. Then punch out the holes and attach a string so it can be worn. This adorable Chinese New Year crown craft features a picture of a pig and the words, "Happy New Year." Print this headband on card stock for best results. Have your students color and build a Chinese New Year "rat hat." The hat has a picture of a rat and says, "Happy New Year" on it. Craft an adorable tiger hat to celebrate Chinese New Year. Kids can color it in, put it together, and wear it home. There's a picture of a tiger with the words, "Happy New Year." For best results, please print on card stock. Follow directions to complete the blank map of China. Write the names of cities and bodies of water. This map of China includes the names of cities, rivers, and oceans. This file has a blank outline map of China without bordering countries or oceans. Play an animal memory-match card game. Match the English animals words with the Chinese animal words. Find the sum for each addition fact. Then color according to the key. The mystery picture is a colorful dragon. Write the answer to each addition fact. Then color according to the key. The mystery picture is a sheep. Find the difference for each subtraction fact. Then color according to the key to reveal a colorful Chinese New Year picture. Write the answer to each subtraction fact. Then color according to the key. The mystery picture is a sheep. Find the product for each multiplication fact. Then color according to the key to reveal a picture of a dragon. Write the answer to each basic multiplication fact. Then color according to the key to reveal a picture of a sheep. Find the quotient for each division fact. 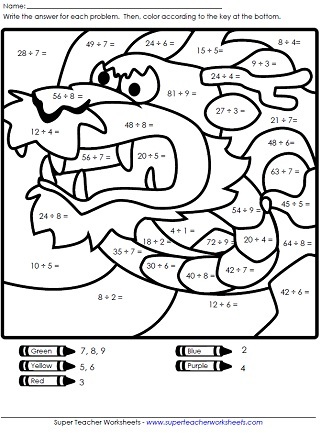 Then color the picture according to the key to reveal a cool dragon. Write the quotient for each basic division fact. Then color according to the key to see a picture of a sheep. Print Valentine's day cards, crafts, and math worksheets. Browse our huge collection of worksheets for all holidays, including St. Patrick's Day, Martin Luther King Jr. Day, Easter, Valentine's Day, Earth Day, and more.